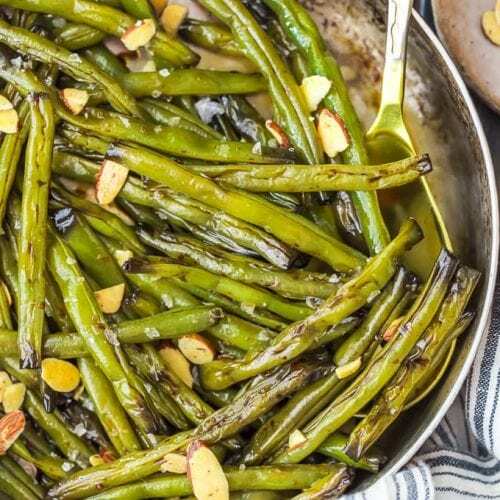 Sauteed Green Beans with Molasses are a slightly sweet yet savory side dish perfect for Thanksgiving, or any dinner throughout the year. To blanche the beans: Prepare a large bowl of ice water and set aside. Bring 2 quarts water to a rolling boil, and add the beans. Cook 2 minutes until beans turn bright green and then immediately transfer the beans to the ice water, being sure all the beans are submerged. In a large skillet, over medium heat, melt 2 tablespoons butter. Add green beans and cook until crisp-tender. Add molasses, honey, Worcestershire Sauce, salt and pepper; stir until beans are glazed.